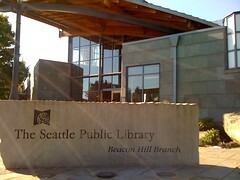 The Beacon Hill Library. Photo by go-team in the Beacon Hill Blog photo pool on Flickr. (This post was originally published February 24.) The Seattle Public Library is holding five “Citywide Conversations” in March to find out what people want from Library services now and in the future. The City Librarian, Susan Hildreth, and members of the Library board of trustees will visit Beacon Hill Library (2821 Beacon Avenue South) on Tuesday, March 16 (that’s tonight!) from 6:00 to 8:00 pm to ask questions such as “What’s one thing you wish the Library could provide, or change? What’s the role of the Library in our community? What should the Library be doing in five to 10 years? How should the Library be using new technology?” You can drop in any time during the two-hour session to give your opinion. The Citywide Conversations are part of a year-long process to develop a strategic plan to guide the Library’s growth and services through 2015. For more information, visit the Library’s Strategic Planning page.